“Halloween fireballs” or Taurid meteors are frequently seen in the night sky from mid-October until mid-November. 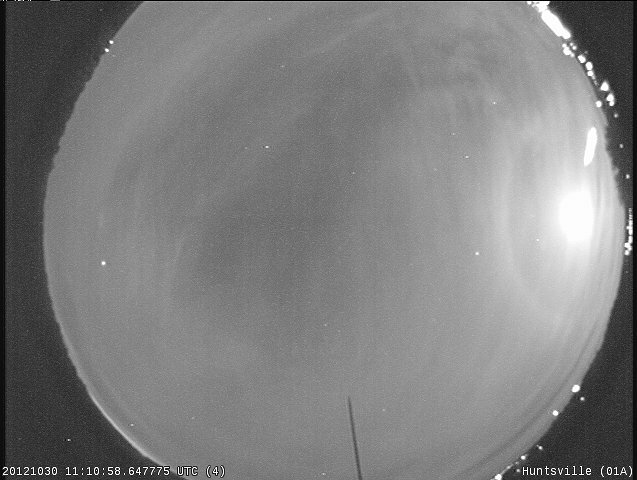 The Marshall all-sky camera network captured an image of an early Halloween fireball Tuesday morning. The fireball appeared low on the horizon from Huntsville at 6:10 a.m. Tuesday morning and was visible just above trees from the Tullahoma station. Widely referred to as shooting stars, meteors are generated when debris enters and burns up in Earth’s atmosphere. Taurids are thought to be debris left behind by Encke’s comet. An “ah-ha” moment on reading this. Last night, 10/31/2012, while driving along the east shore of Lake Winnebago (WI) near Brothertown I observed 2 ‘shooting stars’ within 10 minutes of each other. It was approx 8:30-8:40 p.m. They traveled from NE to SW at rapid speed about 20 degrees above horizon ladting just a few seconds….seemed fairly close to horizon compared to some I’ve seen in the past. I wondered if there was a ‘shower’ so was checking out the web sight. Just being an ‘average citizen’- 60 yr old grandma who drives a lot – I’m always quite moved by these sightings. Very cool. On the morning of October 30 at approximately 6:00 CDT I was walking into a hunting spot in the middle of the Hatchie National Wildlife Refuge. As I was standing, this bright white light appeared from the north, illuminating the woods like daylight, casting shadows of the trees, and as it passed overhead in a couple of seconds, the shadows quickly reversed direction. It was so intense I felt like a searchlight from an overhead helicopter was on me, but there was no noise. As it disappeared into the southern sky, I heard three extremely loud booms which I also felt much like a sonic boom from a plane. The resident birds all began to call for a minute after. In my 62 years of living on this planet, and witnessing several meteor showers- some very bright- I can tell you I have never witnessed anything like this. The experience was not totally unlike that seen in the movie Close Encounters of the Third Kind when the mans truck was stopped at a railroad crossing and he was engulfed in light…..and unlike William Dreyfus’s character in the film, I plan on keeping my mouth shut!